Besides picking out who the bridesmaids will be for the wedding, deciding what they will wear is most important. 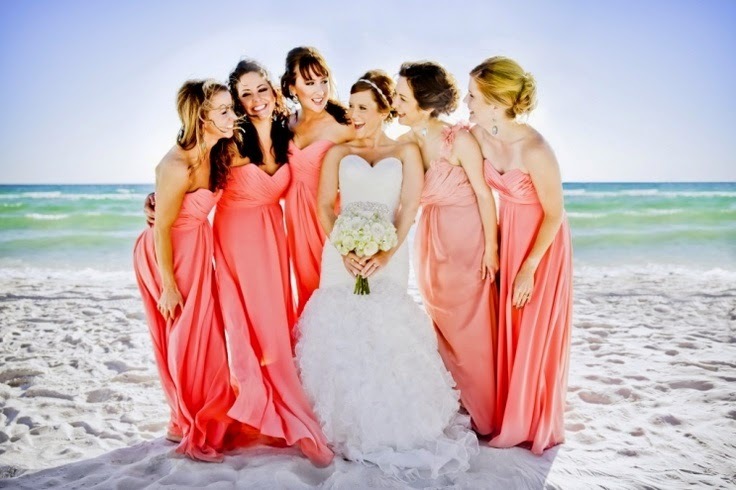 Bridesmaids generally make up half of the bridal party and will be part of the pictures kept forever more. By remembering these 5 factors you can rest assured that on the big wedding day the bridesmaids will have dresses that perfectly accentuate the bride and groom. 1. Price. Price can be a touchy subject but it must be considered first and foremost because it is important to know what everyone can afford before looking at dresses. Deciding as a group what the limit on price should be will keep everyone happy and comfortable buying the dress chosen. 2. Color scheme. When deciding on bridesmaid dresses it is important to make sure that the color or colors of dresses chosen coordinates with the rest of the wedding's color pallet. During the ceremony having too many colors can be confusing and distracting from the real show case, the bride and groom. The color scheme is very important. 3. Style. Not every style of dress is flattering on every woman but some styles are more likely to be. A dress with a looser fitting skirt and defined waist is a good option for a variety of body shapes. 4. Similarities. If you decide against matching dresses it is important to remember to keep something similar between the bridesmaid dresses. Try having all of the dresses in different styles but in the same color or different styles made from the same fabric. Having some detail be consistent will keep the selection of dresses coherent with the wedding theme. 5. Venue and season. If the venue is indoors then the bride could select any style of dress but if the venue is outdoors then the season needs to be considered. Certain dresses would not be practical all year round. Knee length dresses in December or long sleeves in July would not make sense for the bridesmaids. By keeping these 5 things in mind shopping for bridesmaid dresses will be the enjoyable experience it was meant to be. There will be no arguing over prices. There will be no one feeling uncomfortable in the dress. What there will be is carefully thought out dresses that coordinate together and to the wedding so that each bridesmaid will look like the beautiful accompaniment to the bride and groom that she is.